Joe Zabar: “It appears that we are all for fairness and equality as long as it does not impact too heavily on the economic ‘bottom line’.” Photo: Fiona Basile. THREE million Australians, including more than 730,000 children, live in poverty, attendees at a Catholic Social Services Australia conference were told. “We are becoming a nation divided, with the spoils of economic growth becoming ever more concentrated in the hands of those already with wealth,” CSSA strategic operations and economic policy senior director Joe Zabar said. 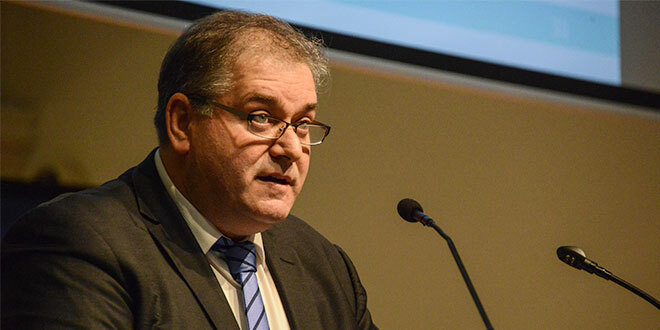 Mr Zabar quoted Pope Francis as he spoke at the “Hearing, Healing, Hope” conference in Melbourne on February 22. “Just as the commandment ‘Thou shalt not kill’ sets a clear limit in order to safeguard the value of human life, today we also have to say, ‘thou shalt not’ to an economy of exclusion and inequality. Such an economy kills,” Mr Zabar said, quoting the Pontiff. Mr Zabar has spent decades advocating to government policy and decision-makers with responsibility for, and control over, the important economic levers which impact on the social and economic wellbeing of people in Australia. He acknowledged that the global economy was growing at record levels and lifting billions of people out of poverty. According to the World Bank, the number of people living in extreme poverty globally has reduced from 41.91 per cent in 1981 to 10.67 per cent in 2013. Mr Zabar said the economic statistics hid “the lived reality” of the three million Australians living in poverty, the more than 700,000 people unable to find suitable work, the 160,000 long-term unemployed and the 1.1 million people looking to increase their hours of work in order to improve their financial wellbeing. “Our current economic policy settings, which give primacy to markets and competition, is increasing inequality in Australia,” he said. The concepts of “merit” and “fair go” could no longer be regarded as universal Australian values, he said, because for many young Australians their future prosperity was dependent on the wealth of their parents. Unless this was addressed, Australia would see an ever-increasing level of inequality, he said, consigning those families in poverty to inter-generational disadvantage simply because they were born in the wrong postcode. Mr Zabar said Australians were not born equal. “Circumstances, not of our own making, will factor heavily in the opportunity and quality of life we lead,” he said. “As a society blessed with riches we have witnessed the rapid advances in technology, education and medicine giving hope and opportunity to people who, only decades earlier, might have been forgotten or ignored by everyone other than their family and friends. “While much more needs to be done, there is a ready acceptance by most Australians that policies which discriminate against a person based on gender, race, disability or religion are wrong. “However, when it comes to economic policies that favour one class or group of people ahead of another we seem less concerned. “Economic inequality, whether deliberate or as a consequence of the operation of the market, seems somehow okay. “While we might acknowledge the moral hazards of discrimination, we temper our concern for fear that it might interfere too much with how the economy works.